A wide choice of formats, also in the tensioned version, with the Multiformat screen: surpassing the highest expectations of home cinema lovers. 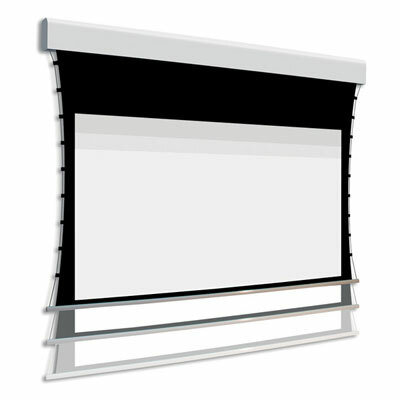 Starting from two independent projection surfaces (a top masking surface and a rear projection surface), attached to two rollers: by synchronising these you can vary the format of the projection area, and obtain an image which is always edged in black, enhancing contrast. These are special, non-varnished anti-reflective black edges, with a width of 70 mm (while traditional edges are 30 or 50 mm wide). The top surface is directly in contact with the rear surface, thanks to the vertical alignment of the rollers: this avoids the formation of shadows during projection. Planarity is ensured by the front drop of the surface, while the special anchoring to the roller eliminates any risks of horizontal crease marks. A perfect surface is possible at all times, thanks to a dedicated command that unrolls the surface completely, to facilitate cleaning operations. The winding is through Nice Era Mat radio integrated motors with remote control included. The case is white (RAL 9016), with brushed aluminium lateral ends, which completely mask the screws. The anchoring system is simple and super-quick, for easy installation procedures. Numerous solutions, but only one tensioning system: a classic. Two elastic cables depart from the base and are threaded through dedicated same-size eyelets, placed along the sides of the screen: the arch that forms laterally ensures a harmonious aesthetic impact and a crease-free rolling, despite the presence of the eyelets.